My friend’s dog Bean is missing since Wednesday night. I’ve posted pictures of Bean before — I love this dog. She somehow got out of an apartment on 17th between 2nd and 3rd. 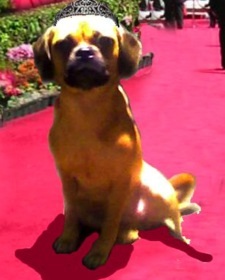 Bean is a puggle, (a mix between a pug and a beagle, she is a smallish dog). She has been missing since Wednesday night. If found please call: 917-612-8086. I wonder what else can be done? I put flyers up around her neighborhood. Maybe Gothamist would be willing to post something? But maybe not. Then they’d be deluged with requests like this.